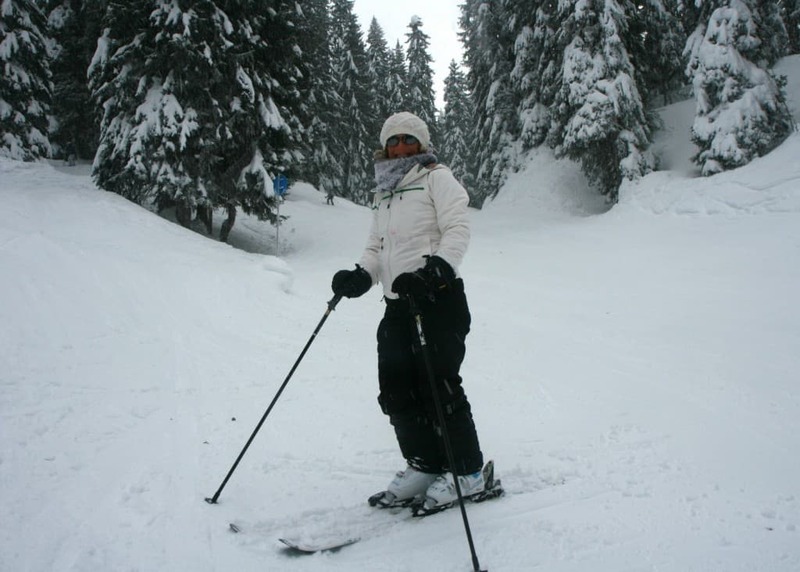 At Clarian Chalets we do everything we can to make your vacation the ski holiday you desire. We will happily suggest a personalised ski tour, book restaurants, point out great viewpoints and highlight our favourite mountain chalets for those toe warming vin chalks… Just ask us. We have detailed below a tour of the Portes du Soleil for more energetic skiers, to enjoy a circuit from Châtel to Avoriaz and back via Les Crosets and Morgins of Switzerland. The route is just a suggestion and is for experienced skiers – there are numerous ways to alter the route, expand or cut short if need be. Just incase it is not obvious, you need a full Portes du Soleil lift pass. We would advise that you check that the lift systems and pistes are open before starting as well as consulting a weather forecast. Be prepared to alter the route according to conditions throughout the day; the weather in the Alps can change dramatically and may be much more severe on summits than in valleys. Keep a close eye as well on the time and the duration it will take you to return. Above all though, have fun! 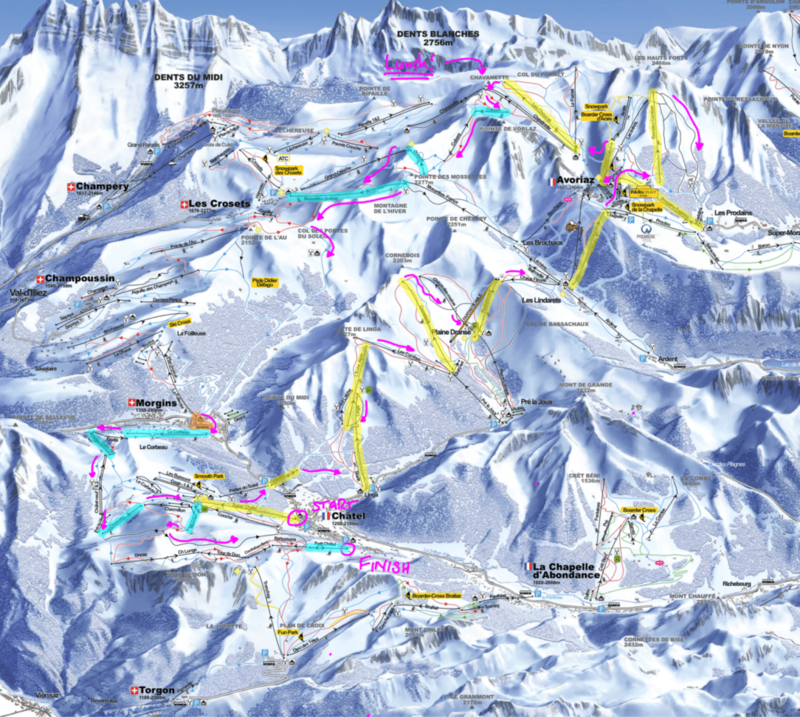 All the lifts are highlighted on the map below: in yellow for the way out (in the morning) and blue for the way back (afternoon!). The suggested direction to head down the pistes is marked by the purple arrows. Ask our driver to take you on the two minute journey to the Super-Chatel gondola, just along from the chalet. Take the Super-Chatel gondola. Turn right at the top and ski half-way down 19 La Combe before branching left at the chalet restaurants, through the forest on 20 La Forestière to the bottom. Gabelou chairlift and ski 24 La Leiche. Telecabine du Linga. Take either the short black or neighbouring blue to continue ascending the mountain on TS de L’Echo Alpin. Ski 28 Les Combes to the bottom of the run. TS de Cornebois, turning right at the top. Ski to the top of the nearby Chaux des Roseés and either choose the red 34 Les Rennes or the exciting black 33 Les Renards, the latter usually covered in moguls. Ski to Plain Dranse. TS Des Rochassons. Ski into the Lindarets bowl on the red Chaux Fleurie which merges into the blue Grand Plan. Cross the bowl for TSD Linderets (or take TSD Prolays if the queue is much shorter). Ski the easy blue Crête keeping left into Avoriaz and continue through on the blue Boulevard des Skieurs, travelling along and under the lift. Keep to the right when the piste opens up and follow blue Crôt about half way down. TSD Grand Combes. Choose your favourite black to the bottom. Coupe du Monde is a fabulous run. Combe du Machon provides for more moguls. Pick up the blue Crôt once more as you reach the bottom of the mountain. TD Prodains Express. Leave the cable car and ski down to the collection of lifts in front of you. Take TSD Stade and leave to the left on the meandering blue Aller de Chavanette and ski through the tunnel. TSD Choucas. Turn left and ski across to the restaurant at Chavanette for lunch. After lunch there is the opportunity to descend into Switzerland via the infamous Chavanette otherwise known as the Swiss Wall. This is for expert skiers only. If you do, take Pauvre Conche to rejoin the route at the bottom of Mossettes-Swiss. The route to avoid the Swiss Wall descends halfway down the red Les Lanches. TSF Cuboré-Morzine and remember to get off a the top – the lift carries on down the other side. Choose how much piste or bumps you would like down Cuboré Montriond. Keep right at the bottom of the lift. Pick up the short TK Cuboré tow. Ski down the other side of the mountain on the blue, passing under Grand-Conche and keeping it on the right, to the bottom of Mossettes-Suisse. Take Mossettes-Suisse. Take the red run part-way back down but bearing left at the fork to Col des Portes du Soleil where you can descend on the long blue run to Morgins. Skis off for the short bus hop to the Le Corbeau lift (if you remember this is a good time to call your driver for a pick up at Petit Châtel later). Glide down the blue ahead to the bottom of Culet 1&2. Take Culet and follow one of the blues, 12 Chalet Neuf or 13 Bellevue, and under the Pré-la-Vieille tow. The TK de Chemaux tow is entertainingly steep. Hold on! Ski towards the top of the Super-Chatel gondola on 14 Chermillon and watch out for the Milka cow! The TS de Morclan chairlift is the last ride up. Get your camera, look out for Mont Blanc and enjoy the fabulous view at the top. Take the short part of red 5 Folière to the left and descend on the black 4 Barbossine. Skis off and jump on the TS du Petit Châtel down the mountain. Stop at the bar for a refresher while you await your driver. The chalet is only three minutes away! After such an exciting ski tour you will be well rewarded back at the chalet as you relax in the hot-tub, sauna or in front of the fire with canapés while our chef prepares a hearty feast. Come and enjoy the Clarian Chalets Experience.